﻿ LaserStreet.com – STANLEY FatMax Tru-Laser TLM 100 - $99 w/FREE Shipping plus Price Matching! Trade & $AVE!!! - Trade in your old Laser Meter for a new Stanley Laser Click here for Trade-In details! 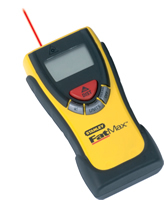 The STANLEY® FatMax® TruLaser™ Distance Measurer TLM 100 measures indoors and outdoors by emitting a laser within a range of 2-100 feet with an accuracy of +/- 1/4 inch at 100 feet. In addition to measuring a long straight line distance, the TLM 100 distance measurer includes an area and volume measuring function, and a calculator function to add or subtract a measurement for a total distance calculation. The tool’s overall precision and reliability dramatically increase productivity. For outdoor use, consider the TLM100 combos midway down this page. THIS IS NOT AN ULTRASONIC DEVICE - it is a TRUE LASER!!! Accurate to ± 1/4 of an inch with a range of 100 feet! Only $149 - Int. Shipping to Canada Included! 4 3/4" x 2 1/2" x 1 1/4"